We’d love your help. 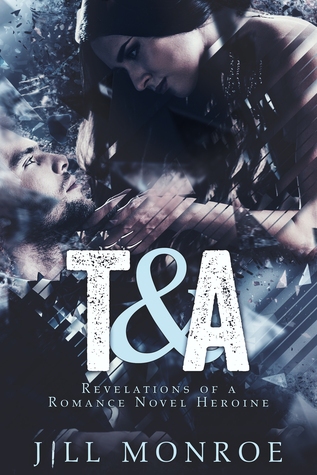 Let us know what’s wrong with this preview of T&A by Jill Monroe. Some think their lives are ruled by fate. Others by chance. But Annalise Morrison knows who crafts her destiny – an interfering author hag – and if Annalise ever finds that meddling writer, she is going to shove that keyboard down her throat. No one is going to tell her who to date, but grrr…why does Theo Griffin have to be so hot? To ask other readers questions about T&A, please sign up. Annalise is a wonderful heroine. She's a strong and confident doctor. She's funny and loyal. She's also honest. Course, you gotta love a book with the heroine arguing with the author and quoting Betsey Johnson. Brilliant!! OMG! I really enjoyed this book so much. It was a fun read with all the neat twist and the heroine thinking she was in a romance novel. I laughed out loud a few times I am sure that the people in the waiting room at the doctors office thought I had lost my mind. I cant wait to read more books like this. I thought this was a really cute book. The premise behind it was fun. I knew how things would play out but still enjoyed the journey there. This is my first book by this author (yay to Gena Showalter for promoting this) so I'm not sure if this her usual style or meant for this book but I found it a little preachy at times. The scene where Annalise says chick and Theo has to immediately announce that he doesn't use words like that was too much. It could fit in as one of those the hero has to be p I thought this was a really cute book. The premise behind it was fun. I knew how things would play out but still enjoyed the journey there. This is my first book by this author (yay to Gena Showalter for promoting this) so I'm not sure if this her usual style or meant for this book but I found it a little preachy at times. The scene where Annalise says chick and Theo has to immediately announce that he doesn't use words like that was too much. It could fit in as one of those the hero has to be perfect things for the meta commentary in this book or it could be sort of apologist for how not feminist a lot of heros have been throughout the history of romance novels. I'm not sure yet but I'm intending to try something else and find out. I credit my interest in writing romance to my grandmother. She gave me my first Harlequin to read during the hot summer days I spent on my grandparent's acreage in rural Oklahoma. Over the years, I would pick up a pen and write down ideas, but it wasn't until I joined Romance Writers of America and then Oklahoma Romance Writers did I become serious. During that time, I c I credit my interest in writing romance to my grandmother. She gave me my first Harlequin to read during the hot summer days I spent on my grandparent's acreage in rural Oklahoma. Over the years, I would pick up a pen and write down ideas, but it wasn't until I joined Romance Writers of America and then Oklahoma Romance Writers did I become serious. During that time, I completed eight novels. The first two will never, ever see the light of day. In fact, I should probably destroy these so no one accidentally reads them! Around my third book, I joined a critique group and began to really study the craft of writing. From there I entered entered several writing contests. In March 2003, one part of my writing dreams came true when I finaled in the Golden Heart. In late 2000, I learned I placed Honorable Mention in Harlequin's Blaze contest, and began corresponding with the editor who bought my first book. I also won a writing round robin on eHarlequin, which was loads of fun! I make my home in Oklahoma (where many of my books are set) with my husband and two children. My hobbies include reading, water aerobics with my mother every morning and watching OU play ball. The least domestic thing I like to do is cook.